Calculating the cost of a material project resource in might take you back to solving problems in your old high school algebra class. Fortunately, Project 2016 makes a straightforward calculation to arrive at the cost of using a material resource. When you assign a work resource to a task, Project multiplies its standard hourly rate by the hours of work for the assignment. But material resources don’t have hours of work: You pay for them by the unit quantity, not by the hour. So when you set up a material resource, you specify a standard rate for a single unit (per yard, or ton, or gallon, for example) and assign a certain number of units to each task. The cost is the number of units multiplied by the cost per use. If you haven’t already done so, click the Material Label column for that resource and then type a unit name (such as gallon). Click the Std Rate column for the resource you want to set and then type a dollar amount (such as the cost per gallon). Press Enter or Tab to finish the entry. The following figure shows that the water and beverages are set up at a cost per gallon, with a setup fee for the company to deliver and set up the water and beverage stations. 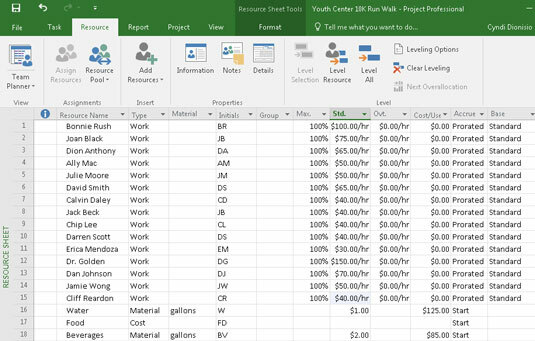 You can also make cost-rate entries in the Resource Information dialog box. 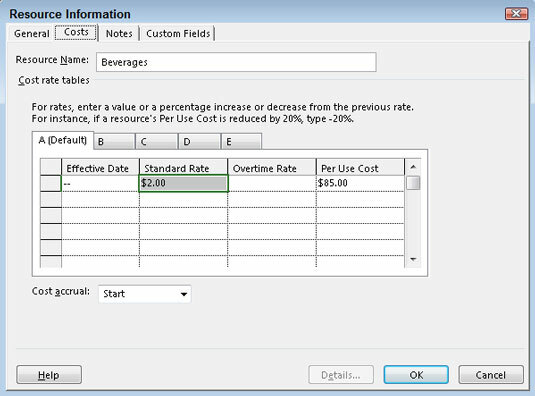 The Costs tab of this dialog box, shown here, offers columns labeled Standard Rate, Overtime Rate, and Per Use Cost. Setting rates in the Resource Information dialog box. Note that you can also use the Resource Information dialog box to enter as many as five standard unit rates with effective dates to account for fluctuations in unit cost over the life of the project.